My thesis supervisor Rand Dyck gave me a copy of Handbook on Canada, an anthropological compilation published in 1897 by the British Association for the Advancement of Science. This book groups together various authors who had written on Canadian natural history and political history, including an early report from the Geological Survey of Canada and one of John George Bourinot’s essays on Canadian political institutions. 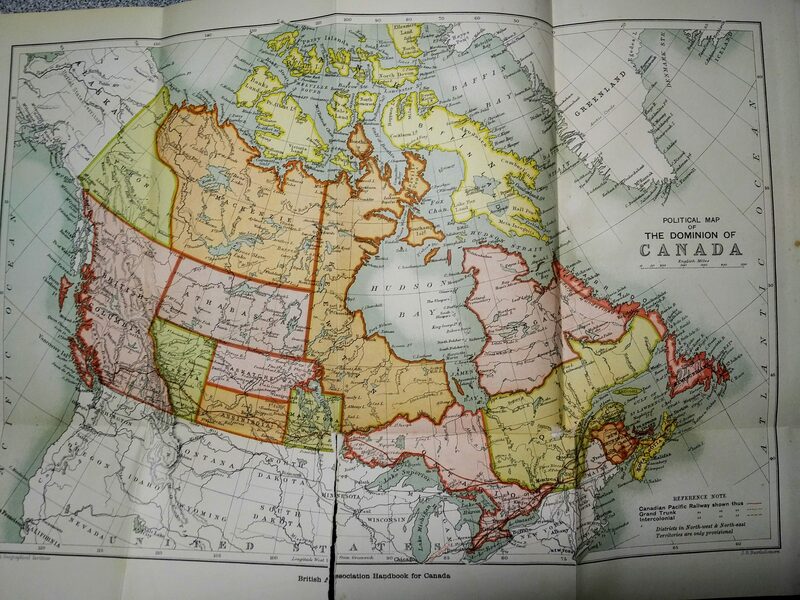 The front matter includes this detailed fold-out political map of the Dominion of Canada, as it then existed. What strikes me are the fuzzy external and internal boundaries of the Dominion of Canada at the end of the 19th century. By then, we had achieved our Counter-Manifest Destiny and become a transcontinental federation touching three oceans, but we had yet to tap into what Tim Mercer calls the great repository of the North-West Territories (as it was then spelled). In 1897, the North-West Territories had yet to become subsumed by the established provinces. It consisted of several administrative districts: Ungava in what is now Quebec; Keewatin in what are now Ontario, Manitoba, and Nunavut; Yukon, which has similar boundaries to the Territory of Yukon from 1898 onward; “Mackenzie”, which roughly corresponds to the Northwest Territories as of 1 April 1999; “Athabasca” in what are now northern Alberta and Saskatchewan; “Alberta” in what became the southern half of the province of Alberta in 1905; “Saskatchewan” in what now forms the middle of the province of Saskatchewan in 1905 and part of Manitoba in 1912; and, finally, “Assiniboia” in what are now southern Saskatchewan and the western part of southern Manitoba. Together these covered huge swathes of the Dominion, including the entire watershed that flowed into Hudson’s Bay. The Dominion Parliament later transferred to Manitoba and Ontario part of Keewatin and to Quebec all of Ungava in 1912. In 1897, “Alberta” and “Saskatchewan” and “Yukon” exist merely as administrative districts within the North-West Territories. Manitoba hewed closely to its original postage stamp borders that the Dominion Parliament had imposed on the Red River Colony in the early 1870s. Yukon did not become a separate territory until one year later in 1898, once Ottawa wanted to reinforce the Dominion’s claim over the Klondike gold. And that, in turn, spurred the Alaskan Boundary Dispute, wherein London sold us out under threat of the invasion of the disputed territory by President Theodore Roosevelt — a man who did not utter mere idle threats. But in 1897, the borders between Alaska, Yukon, and British Columbia remain “undefined.” Nevertheless, even these undefined borders correspond closely to what eventually came to be the settled borders in 1903, apart from the map’s having given to British Columbia Revillagigedo Island and the surrounding mountains. Interestingly, this map treats the Arctic Archipelago as separate from the mainland Northwest territories by giving it a different colour. You can see that the northeastern part of Victoria Island and the south-central part of Baffin Island are outlined with a dashed line, which suggests that these regions remained entombed in multi-year pack ice so thick that 19th-century cartographers couldn’t determine precisely where the coastlines began and the ice ended. They also couldn’t fathom the northern reaches of Ellesmere Island, and they didn’t know that Alex Heiberg Island existed. The rest of Baffin Island looks bloated. On the other side of the country, the boundaries between Newfoundland and Labrador and the Dominion of Canada — then separate countries — also remains woefully “undefined.” It seems that Labrador hugged the coastline of the Labrador Sea in this time, and vast swathes of what was then Quebec extends into what the Judicial Committee of the Privy Council defined as Labrador in 1927. This has fuelled nationalist resentment in Quebec ever since. These old maps serve a dual purpose of cartography and, retrospectively, of historiography as well. All quite interesting indeed! This entry was posted in History of British North America. Bookmark the permalink. • Assinaboia should be Assiniboia: it derives from Assiniboine the French spelling of Ojibwe asiniibwaan ‘stone Sioux’ cf. Cree ahsinîpwât. • Klondite shold be Klondike. • Rillagigedo should be Revillagigedo. 2. When I first inadvertently clicked somewhere in the window, not even on a link anywhere, I was suddenly redirected to (what appeared to be) the splash screen for some sort of survey for Amazon. When I clicked on my drop-down back list, I saw that it was the typical spam repetition of several redirects to the same address, a malware/spamster trick to block you from returning to your previous page simply by clicking the back button or using the right-click dropdown menu to do so.